Alicia Bognanno of Bully. Photo by Macey Norvell. 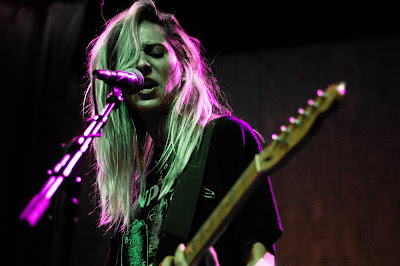 Bully's modern, chaotic grunge rock sound wafted through the recordBar last Tuesday night. Lead singer Alicia Bognanno's sharp punk screaming and relatable, introspective lyrics drew many demographics of fans to the show. The band's performance grew more intense as the night wore on, with Bognanno putting down her guitar and screaming into the crowd near the end of the set. Hits like "Trying" and "I Remember" were saved for the encore. Opening act Melkbelly slowly moved the audience from the bar to the stage with what is likely some of Chicago's finest noise rock.